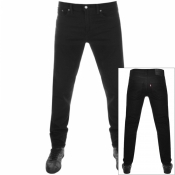 Levis Jeans are possibly the hottest property on authorised stockists Mainline Menswear at the moment. With denim being the must have this season what better time to revisit Levis jeans. or maybe even experience the American premium denim brand for the first time. Levi Strauss created the modern jean nearly 90 years ago with the fantastic innovation of rivets, hardwearing quality denim and comfortable fit, over time Levis has progressed from denim overalls to the global designer fashion brand that it is today. With the instantly recognisable Levis red tab logo and perfect cuts of jeans that go back to the original jeans creations Levis really is a brand to be seen in at the moment. Whether you are looking for the classic 501s, a pair of boot cut 512s, straight legged 504s or the slim fitting 511s. or 519s you really wont be disappointed with the quality and thought that goes into every pair of mens Levis jeans. . So why not grab yourself a pair of Levis jeans now and ensure that either another generation celebrates the quality of a pair of top Levis denims or you revisit the jeans that you will have fallen in love with over the past 30 to 40 years.